An ancient Roman military road connects Bologna to Firenze, running through an incredible landscape where history and nature merge in a six-day walking tale. Have you heard of the Via degli Dei, the Road of the Gods? Now you can walk it in a guided group, with each step telling you its one thousand legends. We start in Bologna and arrive in Florence along the ancient “Flaminia militare” Roman road, the traces of which are still to be found under our feet; along the way we will encounter mountains named after Roman Gods, Roman amphitheaters, military cemeteries enshrined within the woods, and fossils of prehistoric shells embedded in the rock. Our journey takes us from Piazza Maggiore in Bologna to Piazza della Signoria in Florence, the cradle of Renaissance, the much-coveted destination of the trip, where, after emerging from the beauty of Nature, we will admire the mastery of the human hand. Individual arrival in Bologna, a city with many attractions: you will be able to walk across the 7 chapels of the Santo Stefano Basilica, admire the city from the Torre degli Asinelli ("the Donkeys' Tower"), and of course taste some tagliatelle al ragù. Do not miss a view of the illuminated Piazza Maggiore or the Piazza Grande, the subject of a famous song by Lucio Dalla, a bolognese songwriter who used to live a few meters away. From Piazza Maggiore, the heart of the city, you walk to the Portico di San Luca, built in 1674: this is the longest covered street in the world, 4 km dominated by 666 arches, which extends all the way to the Basilica of San Luca. You walk across Parco Tolon where the Casalecchio lock-gate has been managing the flow of the Reno River into the city of Bologna for 800 years. You reach your accommodation in Sasso Marconi, named in honour of the Nobel Prize winning scientist Guglielmo Marconi who was born here. After breakfast you take a short transfer to Badolo, from where you start walking towards Monzuno. The star of today’s walk is the Contrafforte Pliocenico, a rocky bastion that rose from the shallow sea during the Pliocene age (2-4 million years ago) – the proofs of which are to be found in the fossils of ancient shells still embedded in the local rocks. Along the route you encounter sandy trails that climb to the edge of the abyss along the spectacular path that assends to the top of Mount Adone, with its characteristic stone towers. Your destination is Monzuno, where we recommend you visit ’s charcuterie shop, the temple of local food and wine thanks to its meat protected by Slow Food. This section is especially beautiful as you walk through immense green fields and chestnut woods. At your feet are Roman paving stones of the “Flaminia Militare”, the Roman road that used to link Bologna to Arezzo; you will see traces of the Roman passage still visible on the stones to Pian di Balestra, where you find ourselves at the border between Emilia and Tuscany. Today's destination is Bruscoli, where you spend the night in a charming Agriturismo in the hills. We continue to the Passo della Futa, the biggest German cemetery in Italy, where more than 30.000 German soldiers were laid to rest. A place built for the war, now immersed in silence and peace. You then descend the Futa Pass. Monte Gazzaro, with its white cross, is the highest peak that we reach today; from here you will admire the breathtaking view of the Firenzuola valley and Mugello. A wide down-hill path leads you to Sant’Agata, with its museums dedicated to both sacred and peasant art. At this point you will begin to notice the scenery changing around you, a more typical Tuscan landscape. At San Piero to Sieve you can treat yourself to the robust local cuisine of Mugello, and enjoy the typical Ramerino bread (a Tuscan Rosemary bread). After leaving San Piero you continue towards the Castello del Trebbio, one of the residences of the Medici family, now private. This spot offers exceptional views that extend over the Mugello valley and Lake Bilancino. The route continues through large olive groves, continuously climbing to finally reach the Montesenario Monastery, which dominates the mountain with the same name - the view from here, encompassing the entire Mugello Valley, is the "gift from the gods" for your efforts! You are now on the outskirts of Florence, the end of your journey is at hand and there is much excitement! Today’s walk is shorter and we begin by heading towards Fiesole, where you pass through Vetta le Croci, a place where 200,000 barbarians (killed during the battle of Montereggi, 405 A.D.) are said to be buried. From there you continue descending towards Fiesole, a terraced Etruscan town overlooking the city of Florence. Here you can visit the well preserved Roman amphitheatre, climb to reach the San Francesco Church and admire the view of Florence, before heading to the Reinassance city for your last triumphal steps. Florence doesn't need presentation - but you can decide how to enjoy it: after visiting the must-sees such as the Cathedral and the Uffizi, look for the Florence out of the beaten path. Enjoy a walk in the Oltrarno area, through narrow streets filled with artisanal workshops and little restaurants, and enjoy your last dinner in a rustic trattoria. Last day included. Tour ends after breakfast. Hotel University is a small family run hotel centrally located in Bologna, near Piazza Maggiore and University, one of the oldest in Italy. Rooms are basic, spacious and welcoming with TV, free Wifi, private bathroom, air conditoning/heating, electric kettle, fridge. Buffet breakfast is rich of sweet and savoury dishes. Staff is courteous and helpful. Ca’ Vecchia Convention Center is the ideal place to relax and enjoy the fine cuisine of Emilia Romagna, at the foot of the Apennine hills, surrounded by a magnificent park with century-old trees. The main building of the Hotel, dating back to 1770, was originally a Manor House, with three ample halls with fireplaces and eight rooms, a calash parkingspace, three small service rooms and a well inside the building. Moreover, there was an oratory (then become a laboratory for the making of the cheese), a barnwith a stable (the present restaurant) and a second barn behind the House (one of the current outbuildings). A family - run hotel with simply furnished rooms. All rooms have a private bathroom. The hotel has a resturant where you'll be able to taste typical homemade dishes. The Agriturismo is situated in a very special location surrounded by lush hills. All the rooms are spacious and confortable and have its bathroom. The Agriturismo has a restaurant where is possible to taste typical tuscan dishes and game dishes. The B&B is centrally located in the Mugello region and it offers a quiet place to stay, far from any hustle and bustle. Owners are welcoming and helpful. Rooms are comfortable and clean with private bathroom outside the room. Breakfast is rich and natural. Hotel Dino is located in a wonderful position with a view on Florence and Fiesole. Rooms are basic and very welcoming, clean and well-finished with bathroom, telephone, TV and free Wifi. Some of these have a panoramic balcony. The restaurant is very good with traditional dishes of Tuscany cuisine. Owners are welcoming. Hotel Bonifacio is located very close to the Cathedral of Santa Maria del Fiore (Duomo), Palazzo dei Congressi congress center, the Fortezza da Basso and the main railway station of Santa Maria Novella. The elegant building of the Hotel is related to the XIX century, preserved some of the original architectural elements. Hotel Bonifacio is well-known since the beginning of the 50s of this century and the traditional hospitality of the establishment has remained intact throughout the decades. Hotel Bonifacio offers a range of facilities and services that make pleasant and relaxing your stay in Florence. All the 19 rooms are equipped with a private bathroom with shower and hairdryer, direct telephone, color digital TV, minibar and air conditioning. From Florence airport (FLR), take the direct local bus to downtown and then the train to Bologna. From Pisa airport (PSA), you can take either a direct train or bus to Florence and then the train to Bologna. From Bologna airport (BLQ), take the bus downtown. To return from Florence you can reach both Pisa and Bologna by train. everything that is not mentioned in the "What is included" section. The credential contains 10 stamping boxes, sufficient for both versions of the route (5 and 7 days). 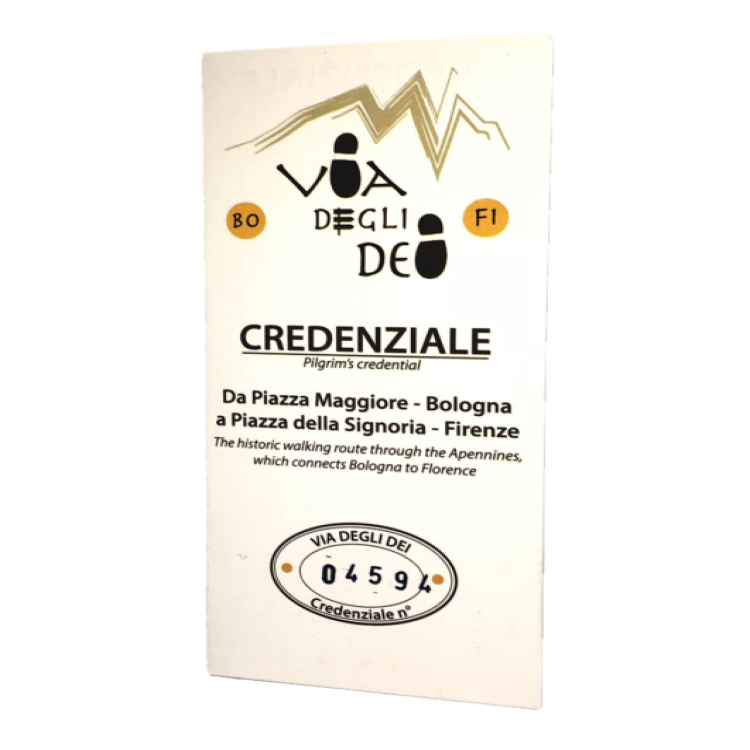 Order your pilgrim’s credential and set off on your way along the Via degli Dei, from Piazza Maggiore to Bologna!